John Wood the Younger had been licensee of the "Rose and Crown," now the "Two Sawyers," at Woollage Green in Womenswold parish between 1820 and 1824 during which time he was convicted and fined for poaching partridges. Shortly after this conviction he left The "Rose and Crown." In 1832 John the Younger appears in the Nonington Parish Poor Rate roll as having a Public House and garden, now Walnut Cottage, in Old (Holt) Street and paying £3 10/- in parish rates for it. The beer house opened in October 1832, having been licensed at Wingham Petty Sessions in September, the same month as the "Royal Oak" was first licensed. In the early 1830's beer duty was greatly reduced and any rate payer could open premises to sell beer, as a result of this change in taxation beer shops sprang up all over the country. The Walnut Tree, as the beer house became, was part of a row of four cottage then owned by his father, John Wood the Elder, a small holder and builder whose family had owned the premises for some time, having probably built them. Before 1832 the premises had been listed as a “house and garden,” and liable to only £.2.00 in rates. Until May, 1831, William Wood, John the Elders brother, had been the licensee of the "Hawks Head", previously The "White Horse", in Church Street. John Wood the Elder, listed in the parish rates records as a farmer, appears to have been the financier behind them both. The Wood family were small-holders who had owned land in Old Street and farmed other rented land in the parish for many years, Daniel Wood, his father, was a member of the Parish Vestry in the 1760's. The Vestry was the precursor to the modern parish council and consisted of prominent parishioners. An earlier Daniel Wood had been Parish Clerk in the first decade of the 1700's. Prior to this other family members had lived and held land in Chillenden and Goodnestone parishes. The Wood family continued to sell beer until in 1870 when John Wood the Younger died, the three cottages, beer-house and the adjacent house, now Park View Cottage, built by John the Younger in the 1850's, came into the possession of the Fredville estate. Members of the Wood family continued to live in the house until the 1970's when Mrs. Edith Rogers, John the Younger's great grand-daughter, died. 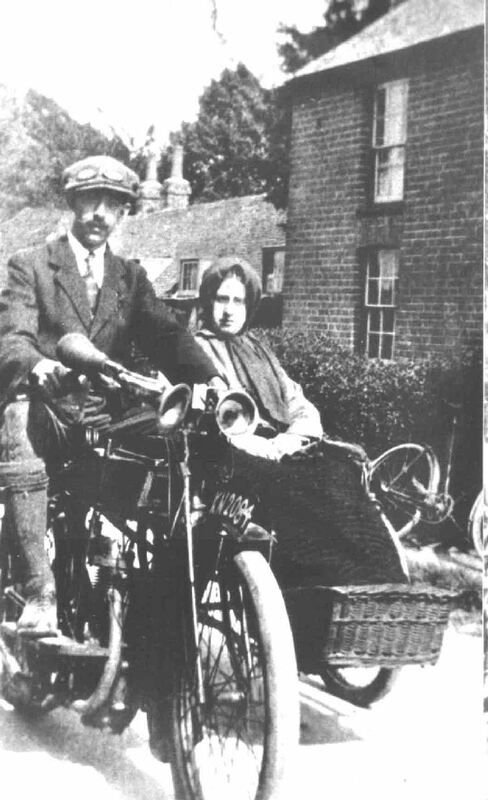 The picture above is of Mrs. Rogers, nee Wood, and her husband Harry, a chauffeur at Snowdown Colliery. Park View cottage, where she lived, is on the right and the roof of the unaltered alehouse and cottages is directly behind her. William Jesse Sheaf became licensee in 1870 and continued as such until his death in 1891, when his widow, Sarah Ann Sheaf, took over briefly. The following year George Farrier became the new licensee. On December 6th, 1894, George Farrier, was convicted at Wingham Petty Sessions of selling beer to be drunk on the highway near his premises. He was fined one shilling with nine shillings costs as the beer licence had been for several years been for off sales only. There were two types of beer shop or house, one with a licence to sell beer, and in some cases, cider and wine for consumption on the premises, the other type of licence allowing for the beer only to be consumed off of the premises. More than one pub in nearby villages began life as a beer shop, only obtaining full licences after the Second World War. The Walnut Tree's licence may have been for off-sales only as The Royal Oak, a hundred yards or so down the road in the Drove was also owned by the Plumptre family and would therefore been in direct competition if it had been fully licensed. This conviction appears to have had serious repercussions as almost immediately the premises ceased to be a beer shop. Various documents, including the memoirs of Richard Jarvis, recorded by F. W. Hardman in 1936, refer to a beer shop known as the “Walnut Tree”, now ‘Walnut Cottage', at the north end of a row of two storey cottages, in Holt Street, as Old Street is now called. Due to structural problems the original four two-storey cottages were converted into three single storey cottages in the 1960's. 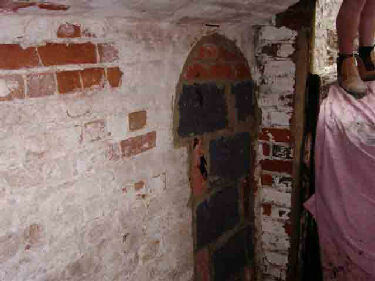 During renovation work in the summer of 2006 a barrel vaulted cellar directly under what is now Walnut Cottage which had been bricked up and buried in the 1960's was re-opened. It had been accessed from what had become the kitchen, but which had previously been the tap room. The barrels were delivered by dray and rolled down from the road on a bricked slope into the cellar where they would have been kept to keep cool, with the beer brought up into the tap room in jugs to be poured into glasses or tankards on demand. Beer was sometimes warmed, I have a conical copper beer-warmer with a handle, which came from the Walnut Tree via my great-grandfather, which would have stood in the the fire to warm the beer through in winter. 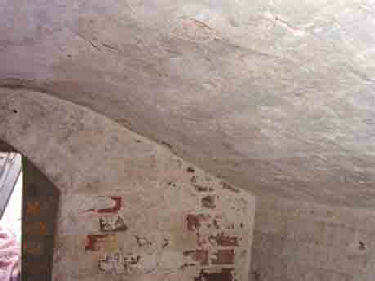 Above the entrance from outside, there were the remains of a bricked slope down from the road to roll the barrels down into the cellar. Above the door, about 5 feet 6 inches high, from the cellar to the tap room. 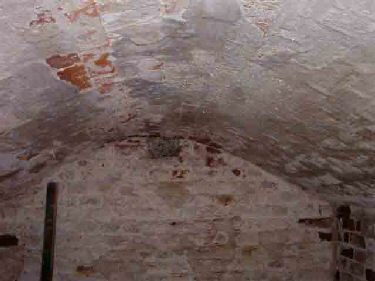 Above shows the brick build barrel vaulted roof. 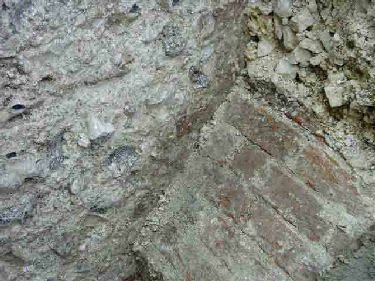 The cellar was approximately 6 feet, 6 inches high in the centre and about 12 feet long and about 6 feet 6 inches wide. From the Dover Express and East Kent News, Friday 14 September, 1888. 1d. The exceptions were the “Walnut Tree,” off license, kept by William Jesse Sheaff, who was fined 2s. 6d. and costs for permitting beer to be consumed on his premises contrary to his license on the 8th October, 1887.